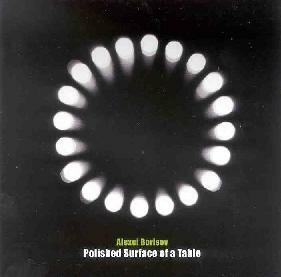 Alexei Borisov - "Polished Surface Of A Table"
Moscow based musician Alexei Borisov has had a varied career, playing in bands covering music ranging from New Wave, to Ska, to Techno-Industrial and Electronic-Ethnic. He also DJ's in clubs and on radio and works as a journalist. Avant-Garde Electronics and Sound-Art is how I would describe his new solo album on Electroshock, Polished Surface Of A Table. Borisov explores a wide range of sounds and covers a lot of territory throughout the album. The tracks typically range from 2-5 minutes, being quick studies rather than lengthy excursions. The album opens with "Revlon", consisting of fast paced, off-kilter blasts of electronics and voice samples. It all comes rushing at you like a meteor shower, and many of the pieces are strangely musical, like little snippets of melody slammed through a paper shredder. Equally musical is the title track, which combines a lazy electro dance beat with howling tonal pulsations, voice samples and a general sense of alien presence. One of my favorites of the set. Many of the tracks focus on assembling sound-art collages of patterns and textures, fields recordings and voices, and my favorites tended to be the ones that communicated a feeling a being lost in the limbo area of the shortwave radio dial, with all the attendant noise patterns. Other highlights include the aptly titled "Dense Drift", which is the electronic equivalent of an earthquake. "Blue Vinyl" is a whimsical piece that brought to mind a screaming riot of alien transmissions. "After The Prime Time" features multiple layers of voices backed by spacey atmospherics and dancey electro beats. The voices continue as the track transitions smoothly into "Dew", which begins with pleasant female vocals which are quickly ripped apart and reassembled like some electronic Frankenstein. And at nearly 10 minutes, "Zaraza (Volume I)" is by far the longest track of the set. Borisov develops an oddball rhythmic pattern that will challenge any listeners equilibrium, folding in voice samples and textured, rhythm infused static pulses and beats. Very interesting. Borisov has lots of good ideas, though he was wise to keep the tracks relatively short as most of the themes don't seem to develop enough to justify anything longer than a few minutes. The tracks that combine multiple contrasting elements were the most interesting as Borisov does a good job of managing varied sounds and effects and bringing them together in creative ways.